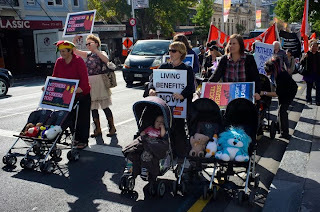 Waitemata Unite is joining a National Day of Protest Against Welfare Reforms, on 5th October, 2012. 2pm Protest outside Bennett's Office, 429 Great North Rd. The new Welfare Regime is due to start in October, and the second wave of "reforms" are going through parliament now. Seven benefits will be replaced by only three: Job Seeker Support, Sole Parent Support, and Supported Living Payment. The Sickness Benefit has been abolished with the sick now having to be job seekers. Most sole parents will have to look for work, including some mothers with babies as young as one . WINZ is threatening to halve benefits of parents who don't use early childhood education, or don't get medical checks, and Job Seekers who fail drug tests, or even- happen to miss the phone when WINZ calls them! People who refuse what WINZ defines as "suitable" work (ie fits WINZ's hours rules) will have their benefits docked for 13 weeks!! Youth only get pocket money. They will be managed by private providers, who can force young mothers with breastfeeding babies to do full time training! People up and down the country are outraged by these attacks! It is time to fight back! Join the Protest! 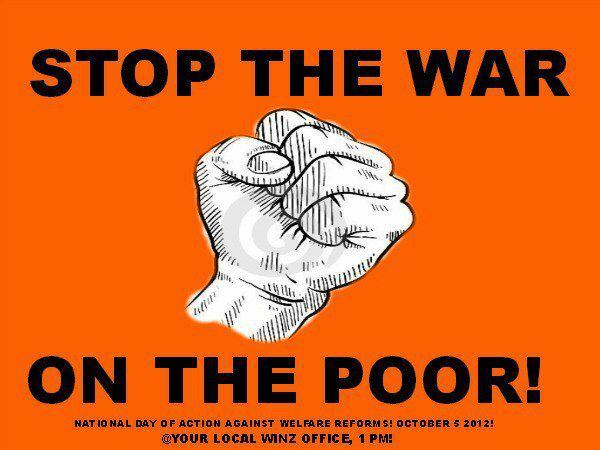 National Day of Protest Against Welfare Reforms, 5th October, 2012. Calling on academics, parents, and our community to unite. Vulnerable parents, and vulnerable communities create vulnerable children. “Beneficiaries are an easy target for Governments to attack, because beneficiaries are in hard times, struggling to survive and make the best out of a hard situation, so organising any form of united front against such attacks is hard work. Picking on sole parents is easy to do, but at what cost? The Government now states they are slashing benefits if parents don’t comply with the new regime. 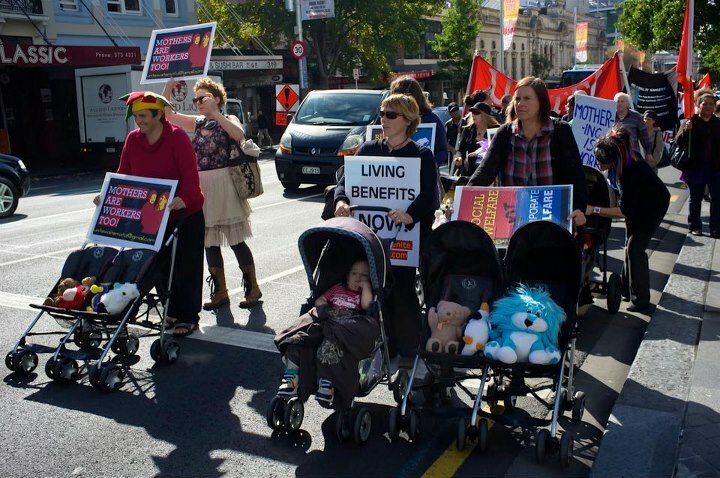 If a parent who is struggling on a benefit gets their benefit cut 50%, who is being punished? It’s the children who will be going hungry. This is the reality! Children will and are suffering from this Government’s punitive measures. Sole parents are not irresponsible timewasters, who can be replaced by institutional day-care centres. Parents are our children’s first and most important teachers. Sole parent are the parents who have taken on the responsibility of raising the child, and have dedicated themselves to this important task. We don’t see this Government chasing up the parent who is not financially supporting the parent who is caring for the child. No, we see women being told they need contraceptives, and to get back to work. Parenting is work. It’s the most important work in this country. We have the research that shows day-care is not a substitute for good parenting. We can’t let this Government treat children like a disposable commodity anymore. Children are our Toanga, and we dam well need to protect them. There were some great academics contributing to the Green Paper on Vulnerable Children who stood up and spoke out against this Governments agenda of benefit bashing. We need these academics to help us unite and have a voice in this country. There must be a debate, at the moment all we have is one punitive measure after another hitting the poor like bombs. This is a call to action for everyone and anyone who is concerned about the direction of our society. Every single parent on the benefit who is being attacked needs to join together to have a discussion. We need the community to help turn this into a discussion, instead of a war on the poor. It isn’t just parents under attack, those members of our community who are unwell are also under huge pressure. People looking for work are being punished for not finding it, when it’s the Government who have destroyed the jobs in this country and continue to do so. So long as you fulfill your obligations nothing will change, those on sickness benefit will be given temporary exemption or fast tracked to the invalids benefit. WINZ Board Members; Profits Before People.